Today, we are excited about announcing general availability of Recovery Services vault, an Azure Resource Manager resource to manage your backup and disaster recovery needs natively in the cloud. Recovery Services vault is a unified vault in the new Azure portal, a replacement for Backup vault and Site Recovery vault. This announcement comes with an exciting set of features including Azure Backup support for ARM VM backup aka v2 VM backup general availability, support for Cloud Solution Provider subscriptions, public preview of Premium Storage VMs and ability to backup on-premises Windows Servers, SCDPM and Azure Backup Server to a Recovery Services vault in the new Azure portal. Application consistent backup for Windows Azure VMs and File-system consistent backup for Linux Azure VMs without the need to shutdown VM. Bottomless Recovery Services vault to eliminate storage management complexity for backup. Efficient and reliable backups to the cloud and in the cloud. In addition to backup support for classic VMs which Azure Backup GA’ed a few months ago, Recovery Services vault also supports backup for Azure Resource Manager VMs. This support comes with the same set of benefits as backup for classic VMs. Azure Premium Storage provides high-performance and low-latency storage for I/O intensive workloads. Azure Backup support for VMs running on Premium Storage will guard these VMs from accidental deletion and VM corruption scenarios. In addition to automating the backup experience for Azure VMs, Azure Backup PowerShell cmdlets for Recovery Services vault will allow for automated management of backup for on-premises assets such as Windows Servers, Windows Clients, System Center Data Protection Manager and Azure Backup Server to the cloud. 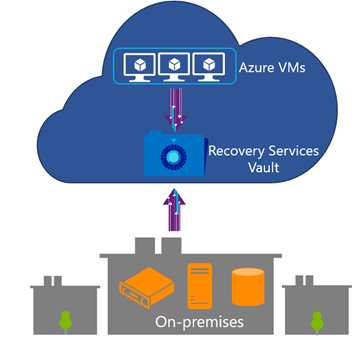 Simplicity is the design goal of Recovery Services vault, in-line with the new Azure portal. Enabling backup for a set of VMs is now a three-step guided wizard. A backed up VM can also be restored to a point in time (Azure Backup supports long term retention using industry standard GFS schema) using two simple steps. Azure provides a compelling value proposition for Partners using the CSP program. With the ARM resource model for creating Recovery Services vaults in the new Azure portal, we are now able to support backup in CSP subscriptions. Partners can use a single solution to safeguard their IaaS VMs in the cloud as well as on-premises data, including files and folders from Windows Servers/Clients and applications running on-premises. To get started with backup of Azure VMs, follow the three steps below. Specify backup protection policy (i.e. schedule and how long you want to retain backup copies). Specify virtual machines to backup.